The WingtraOne PPK is a new fixed-wing drone from Wingtra. The WingtraOne VTOL is suitable for surveying, precision agriculture, and infrastructure inspection. It’s ready to collect data more efficiently in long distance surveying and mapping applications. WingtraOne combines vertical takeoff and landing with long-range flights. The vertical landings on spot allow you to operate the WingtraOne everywhere even in confined spaces and on rocky grounds, even on difficult terrain. It can take off vertically like a quadcopter that means hands-free operation and a smoother ride for the on-board sensors. A new level of simplicity is brought to you by Wingtra's mission planning and in-flight monitoring software WingtraPilot Great features make planning easy and ensure mission success. WingtraOne increases operation safety. By the push of a button, WingtraOne is fully autonomous from takeoff and landing. It keeps the operator in a safe distance at all times. After completing the survey, WingtraOne gently touches the ground eliminating wear and tear. Don't worry about broken wings and damaged cameras through rough belly landings. The WingtraOne is the trusted VTOL platform that exceeds the highest expectations of geospatial professionals around the world. It is designed to be integrated in every workflow. 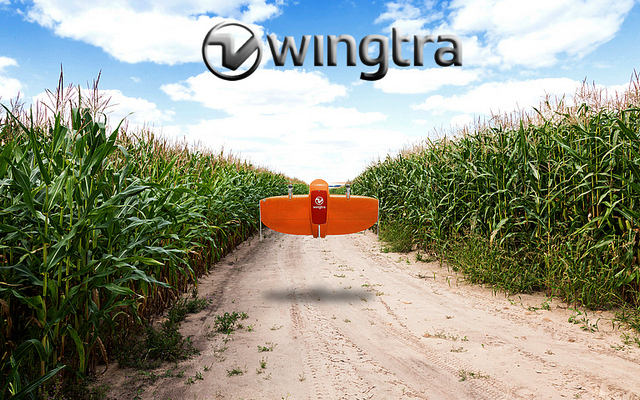 Start taking better decisions based on accurate aerial data with the WingtraOne. In combination with its efficiency and forward flight you now can accomplish large missions that you weren't able to do up until today. WingtraOne carries the best-in-class cameras for your work. They can be swapped in no time on the field With the Sony RX1RII. WingtraOne Drone can offer something that has never been seen before in drone photogrammetry. By adding Septentrio’s GNSS board and PPK module, WingtraOne offers a 42MP full-frame camera with an ultra low distortion lens that enables the unprecedented combination of image resolution and flight coverage. WingtraOne sets the new benchmark for surveying great accuracy. Eliminating ground control points from your workflow by activating the state-of-the-art PPK (Post-Processed Kinematics) surveyors obtain 1 cm accuracy and superior reconstruction results. With the combination of twofold, VTOL capability and the latest PPK technology, we see a clear advantage over the current aerial surveying solutions. VTOL combines the best of both worlds: multirotors and fixed-wings. Capable of flying for up to 55 minutes, the Wingtra is tailor-made to cover long-range areas of up to 400ha at 3cm/px. The Wingtra VTOL is compatible with a variety of payloads including the Sony QX1, Sony RX1RII and the Micasense RedEdge. After the aerial data collection, Wingtra is able to leverage of its partnership with Pix4D and the GNSS board, by using the company’s post-processing software to generate orthophotos and 3D models from the geotagged images. After post-processing the data, results become visual — It allows to deliver maps at GSDs below 1 cm/px (0.4 in/px) with absolute accuracy down to 1 cm (0.4 in). In terms of pricing, the non-PPK WingtraOne drone version is around $20,000. Even though the WingtraOne PPK is now available, it highly depends on the customization – chosen cameras, software and accessories. If you want to get more information, please contact directly on Wingtra or through distributors and find out what is the exact price of the drone for your needs. 0 Response to "WingtraOne - VTOL Surveying and Mapping Drone"